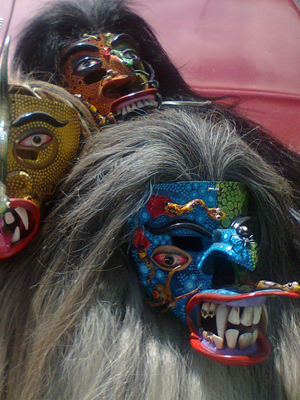 With their frightening spider and snake covered masks, and savage garb, the Tastoan dancers commemorate the Battle of Tonalá every year on July 25, the feast day of Santiago (St.James). The Indian revolt occurred in 1541, shortly after the Spanish, led by Nuño Beltrán de Guzmán, conquered and occupied the old kingdom of the Tonaltecas. This area is now known as Tonalá, a suburb of Guadalajara. The Indian queen Cihualpilli, knowing of Guzmán’s reputation for the committing of atrocities in conquest, had received the newly arrived Spanish troops with open arms and willingly converted to Catholicism. However, her subjects were enfuriated with the European invaders and their religion, banded together to revolt. A fierce and bloody battle ensued, Tonalá was sacked, with many casualties on both sides. Eventually, heavily re-enforced from México City, the Spanish horsemen were victorious. As the legend goes, after the native rebellion was put down, the survivors were found fiding in caves, claiming that Santiago (St. James) had appeared as a great warrior on a white charger, brandishing his sword and spouting flames, routing them. They emerged from the caves covered with spiders, snakes, scorpions and the like. The terrified former rebels then consented to convert to Catholicism. The conversion, however, was not complete. The old Gods and beliefs still remain into the 21st century, evident in many such vibrant dances, mock battles, parades & pilgrimages throughout Mexico. The feast day may be for a Catholic saint, but native dance troops command their fair share of the attention. 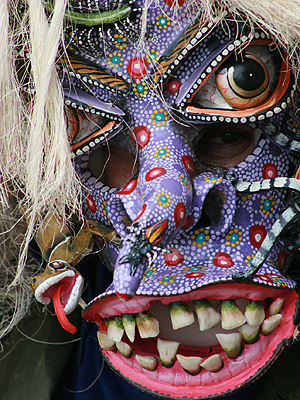 The Tastoanes are symbolic of the fierce and undying spirit of the Mexican people. 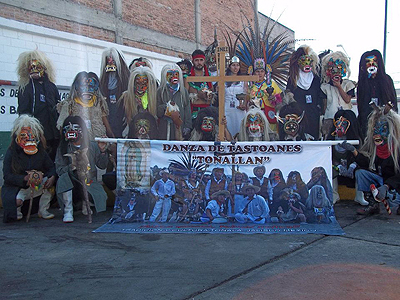 This year, a Tastoan dance, or game was celebrated in Tonalá at the beginning of Semana Santa, 25 March, 2013, to mark the 483 Anniversary of the ‘Mestizaje’, or the beginning of the mixed race that is now modern México. The masks were originally made of ceramic, since most of the community were clay workers of one sort or another. Now, the common material has become leather (often with internal padding) for lightness of and durability. The decorations are made by many methods with experimentation encouraged. Paper pulp, seeds & pods, teeth, bones and horns combine with the new (20th century) acrylic paints. Cow & horse tails or the Maguey fiber ‘Ixtle’ are used for their wild wigs. An account of the battle written by Beltran de Guzmán, himself, recalls that the rebels were so fierce as to appear like demons. This inspired the use of horns on the Tastoan masks. The insects and other fearsome creatures are representative of their aspect upon crawling out of those caves & bushes. Fancifully painted patterns of spots denote the plague of small-pox brought by the Spanish. Traditionally, after the festival most of the dancers, who make their masks themselves, soak them in water and strip them back down to the plain leather base, allowing the spirit of the Tastoan to be released, only to be built anew each year to return to battle. The Tastoanes, a word that comes from the native Nahuatl word ‘Tlatoani’, meaning leaders or speakers, believe they represent the very real and living spirit of ancient México, never defeated, and rising again every year to give battle to Santiago and his Conquistadores. The masks are therefore rare, and collectors items. If they have actually been used in the festival they are said to be ‘jugada’, or ‘played’, and can be rather beat up from the battle. Prudencio Guzman, curator of the National Ceramics Museum in Tonalá, has become well known for his masks. He of course, is a dancer in the festival and considered an expert on all things Tastoan. A visit to the museum is an must for anyone interested in the Tastoanes or the wonderful ceramics of the Tonalá.